For those of us who buy fabric online, a fabric sampler from your favorite fabric distributor is a great thing to have. Missouri Star Quilt Company ( @MSQC ) is my home page (the Daily Deal) so every day I’m presented with a really inexpensive pre-cut begging to come home to me. That’s where I get most of my prints. But you know you cannot even begin to match a solid on your computer. If you try, your odds of getting it right are like winning the lottery, but most of the time you’re just adding to your stash and end up still without the right solid after a disappointing trip to the mail box. 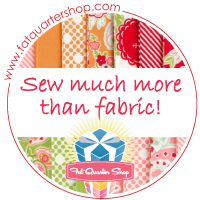 To remedy this, I just recently picked up the Bella Solids Sampler from @FatQuarterShop. I absolutely love it. I’m certainly not trying to discourage you from frequenting your favorite quilt shop. By all means, support those small businesses…they are the lifeblood of our communities. But if you fail in your search, or you live in the boonies like me, a fabric sampler can save you a lot of trouble. Just look at all these choices! The strips are all 1″ x 1.5″ long so you can get a pretty good idea of what will work for your project. Some strategy is required because you need the print fabric first. So I usually order the solid I need on my next order of prints so I can sneak it in on the $5 shipping on my order from MSQC. Had I wanted to use a solid to match these cherries, it would have been very easy to match and make an order online. “Flamingo” would have pulled the color out nicely! About 2 years ago I made a suggestion to @MSQC that in addition to the Daily Deal, that they also provide an idea of what to do with the product (because I have no idea…see my blog page “The Creative Fraud”) and offer coordinating fabrics. I actually received an email back from them saying “great idea” and now they do just that! The other day, I ordered a 10″ pre-cut of a cute farm theme (for the grand kiddos) and they suggested a pattern with a how-to video on YouTube, a solid yellow for sashing, and then other options in that fabric line for border and backing. So yes, I ordered it all. But if you don’t have that luxury of your fabric retailer helping you out, I highly suggest you get a fabric sampler. Now, about those cherries…sigh. Several weeks ago I was in my local quilt shop and they had hanging in the Ladies, a gorgeous quilt called The Texas Two Step. It was a dominant yellow (vs. green in the photo) and I absolutely had to make it. So I have no idea why, but I grabbed a bunch of coordinating pinks. They looked so yummy in the store on the bolts on the shelf. I made it right up and …meh. It’s OK. I was supposed to liven up my all-brown living room by hanging it over the back of the loveseat. But it’s too pink. I didn’t mean for it to be THAT pink. Oh well, it will be a great practice quilt for my baby that’s in boxes waiting to be unpacked. WUPS! Secret! But I’m fixing to add to my Power Tool Arsenal! Stay tuned! It’s lovely and WILL brighten up a brown living room – but any excuse to start a new quilt, right? It is quite pink. But I like it! (And I like secrets….) BTW I don’t see an email address to contact you? Is it just my old eyes? Yes, very pink. I think it will become a For Sale quilt in my studio. You can email me at beckyleethompson at outlook dot com. I’d love to hear from you!